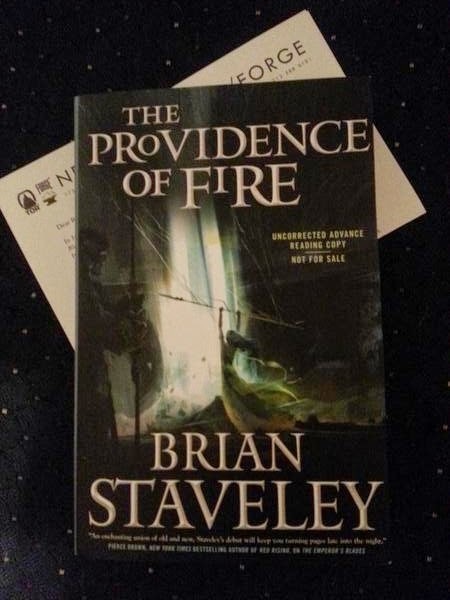 Just the one new review arrival this week, but it's an exciting one - a paperback ARC of Brian Staveley's second installment in his Chronicle of the Unhewn Throne, The Providence of Fire. This will likely be the next big, thick tome I relax with, taking the opportunity to lose myself in his world once again. On the new purchases front, just one new title there as well, but it's an exciting one. 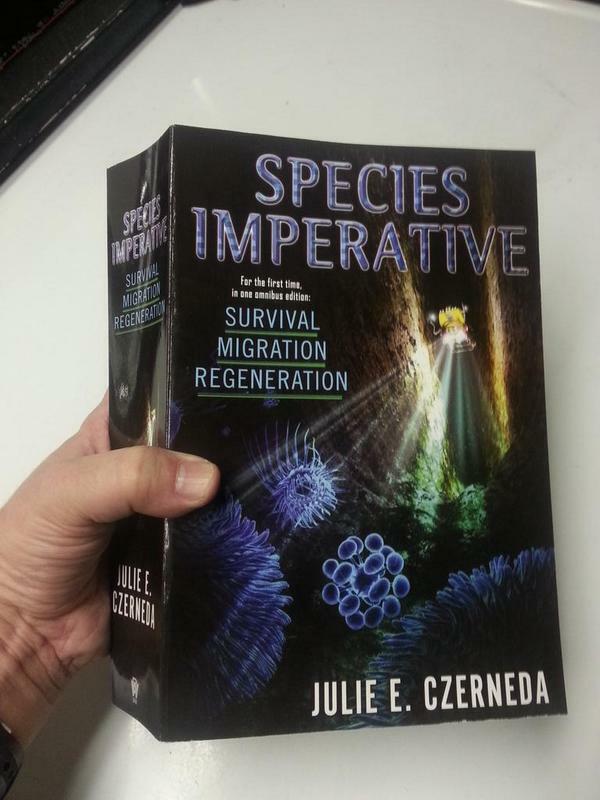 Julie E. Czerneda's Species Imperative omnibus edition is out, complete with the dedication to her loyal biogeeks . . . including yours truly! Probably my most anticipated read of the Fall, I'm anxious to dig in and see if he can capture his screen magic on the page. Early reviews are mixed, but I like what I'm hearing. epic fantasy horror Mailbox Monday sci-fi Stacking The Shelves suvudu What Are You Reading? Curious about that Staveley one. The first one disappointed me but there was a promise that the sister (name already forgotten) would get a lot more screen time this time around. I enjoyed the first book, but I agree that she needs a much more substantial role in this one. You're in the dedications - that is awesome!!! Hurry and read the Croneberg book. Dying to know. LOL - switching jobs this week has seriously impacted my reading pace, but I'll be back on track soon. Great, old fashioned, pulp style adventure, Dez - just as much fun as the first one so far. I think I got lucky in that I read the first before there was much hype, although I think everybody agrees that Adare needs a more significant role. It's maybe a little too fantasy for me I confess but I hope you'll like them. Happy reading! OOh very nice! As usual these are all new to me but still look exciting! Happy Reading! Ooh, being in the dedications is amazing -- I've been mentioned in album notes for a couple of folk musicians, but not people most people have actually heard of. I have actually heard of that author, haha! I've never tried any of her stuff though; must look it up. Yeah, opening yhat dedication to her fans was a very cool move on her part. Gideon Smith looks like fun. Species Imperative looks interesting but huge-yikes! Very cool about the dedication. I have to admit I'm not much of a fantasy or sci fi fans, so I'm sticking with usual (possibly boring) crime fiction / suspense novels!!! Jealous to see that you already have that Staveley book. I'm interested to see what people think of the series now that the second book is out and has potential for being much better than the first. Congrats on the dedication. That's really cool. And happy reading for sure. It's always fun to have a coveted ARC! I like big books and I cannot lie. Cannot wait to hear about the omnibus!